BensonHsu.com - previously the sileightymania.com journal. Benson on Buy my hood please! toan on Buy my hood please! Xzibit’s song Paparrazi sampled this song by Barbara Streisand that was originally composed by Gabriel Fauré in 1887. I’m tired of looking at this hood. Somebody please buy it from me! $240 and it comes with Sparco hood pins! 1989 Nissan 240sx Commercial with Drifting! I thought this old commercial was very amusing. It is an old commercial featuring the zenki model 240sx coupe and hatch and they are racing around the track together drifting. According to the video description, the drivers are Rod and Steve Millen. I’m not sure if it’s true, but these guys deserve some credit! Moto and Craig Taguchi were kind enough to extend to me an invitation to the Scion FR-S release event last week at Milk Studios in LA. It was a really awesome to see the old touge crew, the old drifting guys and all the other car buddies all together under one roof. 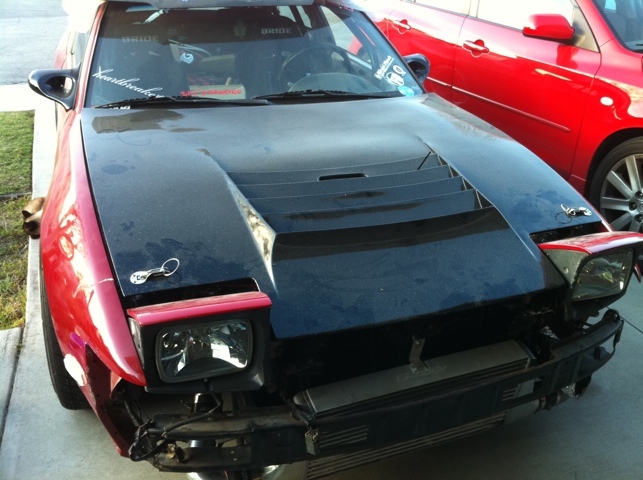 The original AE86 was a common bond that brought many of us together. 12 years later, its redesign brought us together again. Moto from Club4AG was kind enough to translate a message by Tetsuya Tada, the chief engineer behind the Toyota GT86 / Scion FR-S, during a press conference in Tokyo. I think this clarifies if not explains a lot of things regarding the design of the car and the reason why it is what it is. For me personally, a lot of things made so much sense after reading it. It also made me realize that, although this wasn’t as apparent 20 years ago, the s13 is in many ways very similar to the ae86. Road to development: focal point of the product is centered around 3 historical sports cars Toyota has produced in the past. S800 being the original lightweight low center of gravity, pure sports car of dynamic balance. The 2000GT for the advancement of Japanese sports car to previously unattained height of performance and racing successes. And most of all, the AE86 as the center of enthusiasm, joy of driving and coveted by the enthusiast. President Akio Toyoda has expressed the desire to develop and introduce once again, a car that has the attributes of uncompromised driver engagement, affordability, and catering to a very select group of buyers who value such product and intrinsic nature of the automobile. While the currently available sports car are high in catalog specifications, they are also difficult to attain in terms of price. The truth of the conditions today, are that, most enthusiastic of driving hobbyists, are still driving and enjoying the a car like the AEA86, despite its age, for its unmatched characters of simplicity, engagement, freedom of driver, ease and cost of maintenance, and feverishly work to keep it running in top shape, without much desire for newer, more advanced vehicles. Subaru, our partner in this task, has also a deeply rooted history of making enjoyable, enthusiastic, engaged automobiles today, and together by utilizing Subaru’s proven horizontally opposed engine and chassis design knowledge, and it’s spectacular engineers who passionately developed their cars on the field and in international racing, joined Toyota in common goals, of design and passions in making the FT86 the ultimate in driving pleasure, meeting the goals of the deepest driving enthusiasts. “Built By Passion, Not by Committee” as been a key phrase in our development and standing culture. Where inter-departmental challenges within the firm, media, journalism, and financiers, alike, will not cause our team of any compromise to the design goals, and that the focal point of the product be consistently focused on the mission created at the start of this project. There have been many cultural clashes within many departments and technical differences and pride of various technical skill sets and innovations, within both firms, and between. But we’ve come to agree that the car should be a collaboration of best merits to refine the single goal, to add the resources of 1+1 (Subaru and Toyota) and create what sums up as 3. The elements that define today’s sports cars in many ways, “ultra high performance tires, turbocharging and extreme power output, exotic technologies, and use of advanced all wheel drive” ALL of these elements from the start, has been completely omitted. This, proven and repeated by our core panel of not traditional corporate product specialists, but of the thoughts and minds of the driving enthusiasts, that these elements reduce a driver’s engagement, despite the speeds and performance owed to advanced technologies. This project was not about designing a car from a catalog specifications standpoint, but again, driver engagement. We’ve attended many local and regional amateur and professional competitions, both domestic and internationally, and received such feedback that confirmed, and concurred in many ways with our original thinking. That a sports car should be about the control, and putting the driver as the central component of driving pleasure, and the machine to provide that and only that, regardless of any comparisons to another automobile which may have higher specification in catalogs and performance numerical data comparisons. More important than the specifications in raw terms and numerical data, the sports car we present today is about the subjective and tactile feel. The AE86 enthusiasts and sports car fans deeply seeking thrills of driving have never placed the numerical specification to a high priority. We are not making a car for the appeal inside a catalog, or campaign, is how I felt many times in the process of design. We’ve consulted with the president many times directly to push and express our focus. Driving pleasure at extreme driving on a race track is a given focus. Still, in addition to the exemplary engagement of the car on track, even in routine use on public roads as transportation needs of daily life, we have gone great lengths to remind the driver that this is a car to excite your senses. Everything, from the lowest in class hip point, which requires a certain passenger and driver articulation for egress/ingress into the cabin, and instant response of steering even when routinely turning an intersection, should evoke a sense of difference and feeling of escape from the mundane. In addition to enhance and contribute more to this goal, design elements as the guage cluster location, shift lever travel, all major and minor control switches, knobs and levers, and even down to the fonts used on the cabin and instrumentation, is focused on driving engagement. Horizontally opposed 4 cylinder in conjunction with mid-balanced rear wheel drive layout was chosen, and utilized in this car for the reasons that add to our goals, and is something we’ve used in the S800, and Subaru has been working until now, for reducing the center of gravity to the lowest point possible. We’ve achieved the center of gravity akin to the likes of more exotic pure sports cars such as our LFA, and many of the best European cars that fit in pure sports category. The engine, we’ve adamantly chose and adhered to a naturally aspirated 100bhp per liter of displacement, which spins freely to high spectrum of rotational speeds, while achieving or exceeding all international environmental emission requirements, and fuel economy. By combining our collective expertise on the engine layout, design and in conjunction with 4D-S direct injection, we feel that we have met these requirements quite well. Important in this decision was that direct and linear power output was essential to the immediate and precise control of the automobile by the driver. Again, initial plans for any turbocharged powerplant, were dismissed for the characters that may distance this character from the single focus of driver engagement and controllability. We’ve considered pure sports cars to be 2 seats, but upon observation of Sunday amaterur racer-enthusiasts, we have witnessed that many of them appreciate the cargo space that is ample enough to carry items needed at the track, such as full set of 4 spare tires and wheels, helmets, and parts and tools. The rears seats, though present for convenience, is really a result of our dedication to provide the cargo space, when folded, required for drivers into these events, so as not to require a secondary transport vehicle to separately haul these items. In our design process, we’ve made sure that all of the said historical cars, were always available for sampling by our design teams and engineers. This includes the constant presence and availability of even the 2000GT from our museums in complete operating condition. Another key importance we’ve placed on this vehicle is the collaboration and growth with our users, and key development of 3rd party add-on manufacturers, to be constantly in touch to gather feedback and develop continuously with the users for not only the present but for the future. It is an embodiment of our newly developed and singular philosophy of a single product, detachment from the usual car making processes. Lastly, we’d like to remind you, that this car is all about the “software” the subjective feelings, rather than the catalog list of hardware. To bring the legacy and the reasons of many fans that surround our heritage of our cars of the past. To present the same thoughts and passion, that will translate to today’s buyers, and hopefully continue once again, the legacy and footsteps that our heritage has paved, with our previous sports cars. We are proud to reveal our achievement at this opportune time, at the Tokyo Motor Show. This car is definitely exciting and I’m hoping that it will shake up the automotive industry a bit. New cars have advanced leaps and bounds in technology but are getting further and further away from the experience that you used to get from the cars in the 80s and 90s. I love my G35 sedan and my Mazdaspeed 3. They are great handling cars with a lot of HP and that do everything a good car should do. But why is it that they don’t evoke any emotional response from me when I’m driving them? When I drive an S13, I feel like I’m bonding with it. I feel like it has soul. This is something I feel is missing from new cars. I hope this Scion can figure out what’s missing and bring it back. For more information on the car, check out the new website. 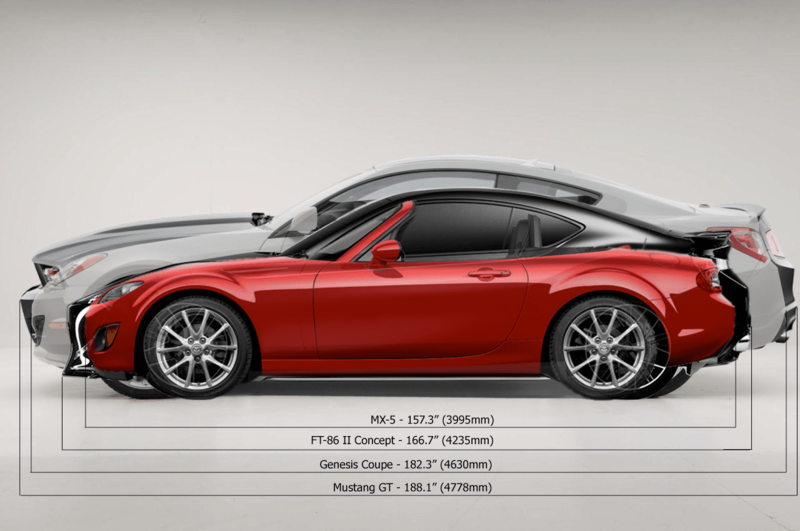 I saw this image on the net and thought it was a great way to show the actual size of the new FT-86 aka Scion FR-S aka Toyota GT86 aka the Subaru BR-Z. Man, there are too many names for this car. The FT86 is only 9.4 inches longer than the Mazda MX-5 Miata, yet it has 2 more seats and what appears to be a much longer wheelbase. And for your Nissan heads out there, the S13 is 178 inches long, and the S14 is 177 inches long. The family has been doing Meatless Monday for 3 weeks now, in efforts to reduce our carbon footprint. Plus a little less meat in our diet is a good thing! I’m going to try to post up successful recipes that I’ve used for those of you who want to try joining in on this Meatless Monday movement! One mistake I realized that I made is that this recipe uses parmesan cheese. The best way to help the environment is by omitting all meats as well as milk and cheese. 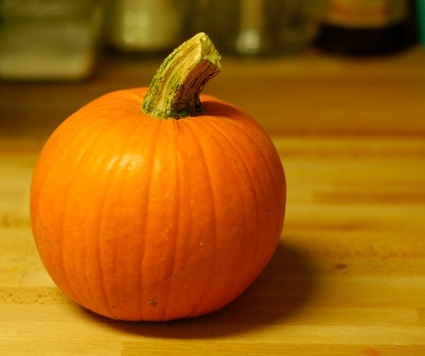 This recipe is in 2 parts… making the pumpkin puree and then making the risotto. I used pumpkins that looked like this. They were a little bit larger than the size of my fist. Place each pumpkin half on a large piece of foil. Wrap with an additional piece of foil to keep all the moisture inside so that it will steam in the oven. I searched Google for fresh pumpkin risotto recipes and I had the worst time… have you seen how many varieties of pumpkins there are? Small ones, flat ones, round ones, plump ones, green ones… nobody says “buy this type of pumpkin” and most recipes use canned pumpkin or butternut squash (is that even considered a pumpkin?) Because I didn’t know what kind of pumpkin I bought I just drew inspiration from one of Giada Delaurentis’ recipes – they never steer me wrong. This is a modified version though, as her recipe uses fennel, goat cheese, bacon, etc. This recipe requires patience and a good 45 minutes standing in front of the stove stirring. 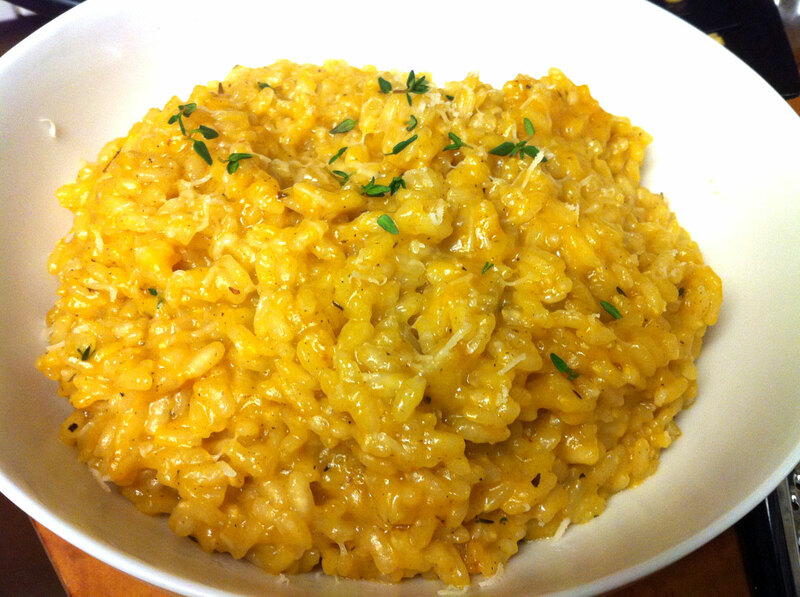 Take special care to not let the risotto burn or else there is no going back and you’ll have to start all over again. In a medium sized pot, add broth and whisk in the pumpkin. Bring the pot to a boil and reduce heat to low. Add 1/4 cup of pumpkin broth (I measured this to be about half a scoop from my large ladle) and stir constantly until absorbed by the rice. Repeat this step until the rice has cooked thoroughly and has a firm bite without being crunchy or chalky in the middle – about 30 minutes.